Make your weekend break the best ever by booking our competitively-priced two nights’ Singapore package comprising accommodation, transfers, sightseeing, and remarkable Singapore Flyer experience. A place of inimitable charm, Singapore seamlessly blends cosmopolitan edginess with its strikingly appealing cultural landmarks and picturesque surroundings. Precisely, this small yet wonderful city-state boasts of all elements for a refreshing mini break. A sightseeing tour of Singapore allows you to uncover the region’s incredible sophistication and inspirational heritage. Led by a knowledgeable guide, it ensures a genuine insight by offering intriguing narratives surrounding the iconic attractions. Survey the gorgeous attractions that dot Civic District and make a stop at the renowned Merlion Park for a short photo-snap, before you set out to discover the distinct sights, sounds and flavors of Little India and Chinatown. Orchard Road, Suntec City, and Marina Bay are also covered in the itinerary. 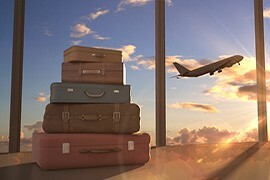 That’s not all, your short break in Singapore further takes you on an exhilarating sky-bound experience! Hop into one of Singapore Flyer’s air-conditioned glass capsules for an unrivaled look at the extensive sights of Singapore and beyond. As it rotates and reaches the summit, this colossal observation wheel treats you with the most enchanting views of Padang, Marina Bay, Raffles Place, Merlion Park, and Singapore River, among other iconic sights. Spent 2 days in Singapore with my family and it was a memorable experience. Our stay was comfortable and the city tour was exciting. The best part was the ride on the Singapore Flyer. It was just after sunset and so we were able to see the entire city in its shining glory. 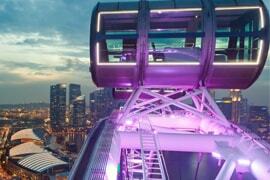 Would love to come back to Singapore Flyer with Rayna's tour packages and explore more! Our family's weekend break in Singapore was a memorable one. While the city tour was interesting and informational, it is the Singapore Flyer tour that we loved the most. Our guide had told us that we would be able to see Malaysia and Indonesia from the Flyer and we were so excited. So apart from the entire city and the major landmarks of Singapore, we were able to see the neighbouring countries too. It was such a surreal thing!